Finding a wedding venue in and around Bangalore can be quite a daunting task, simply because the choices are unlimited. However, the selection is always centred on some crucial worries and concerns. Budget, location, convenience and of course the kind of tone it sets for your celebration. One of Bangalore’s major IT hubs and with the recent boom in residential construction, Whitefield has turned into a key wedding location too. High rise industrial buildings with posh localities nearby make it all the more ideal to host a classy wedding. Look no further for lavish banquet halls in Whitefiled. We give you our top 5 picks that will suit every budget and kind of celebration. Take a look. When a larger than life wedding demands a lavish wedding venue in Bangalore, Fortune Select Trinity opens up its plush green lawn for it clients. Conveniently situated amidst the IT hub, this upscale hotel is an ideal choice to host a wedding of a lifetime. In addition to its 4180 sq. m of outdoor lawn area, the hotel has a spectrum of 5 tastefully designed AC banquet halls in Whitefield. Whether you wish to host an intimate party for 100 guests or a grand reception for over 2500 guests Fortune Select Trinity has got you covered. You can rely on their expert banqueting staff to take care of all your wedding services requirement right from the time you book your venue till the bidaai ceremony. Their internal culinary chef’s team prepare delectable that is simply out of this world. A customized menu will be prepared to suit your taste palettes. Since alcohol is served in-house, outside alcohol is not permitted at the venue. Another fine hotel situated in the IT hub of Bangalore is Radha Homotel. Perfect for budget-conscious couples, this hotel offers exquisitely designed banquet halls in Whitefield that will leave you stunned. You can choose from their multiple banquet halls that are stylishly designed and ideal for small gathering celebrations, like mehndi and/or sangeet. Should you want to host an extravagant reception their outdoor lawn can easily comfortably accommodate large crowd. With absolutely no compromises on quality, their budget-friendly party halls in Whitefield coupled with excellent staff service will surely not disappoint. The venue provides in-house catering and alcohol arrangements. Décor and music arrangements can be done by the couple. Whether it is an intimate engagement celebration or pre-wedding festivity that you want host in a classy style Aloft has variety of banquet halls in Whitefield to help you make your wedding venue selection easier. Should you want to take your celebration outdoors, you can choose from their fancy poolside area that can easily accommodate to over 300 guests or if looking for bigger space, their wedding lawn area can is an ideal choice if your guest list is somewhere over 1000 people. With all wedding services, including catering, décor and music available at the venue, Aloft is your ultimate wedding destination. Even though the venue allows you to make your own arrangements for whatever you need to make your wedding a grand affair. Celebrating your happily ever after moment doesn’t get grander than this. Holiday Inn has a track record of celebrating wedding that have eventually become the talk of the town. With couples now opting for close and intimate celebrations, their banquet halls in Whitefield give couples gamut of choices. Indoor or outdoor their each space is magical. Scrumptious catering is provided by their in-house culinary experts. You can make your own arrangements for décor. Talk about luxurious big fat Indian weddings in Bangalore and The Marroitt Hotel in Whitefield, Bangalore is what will immediately pop into one’s head. 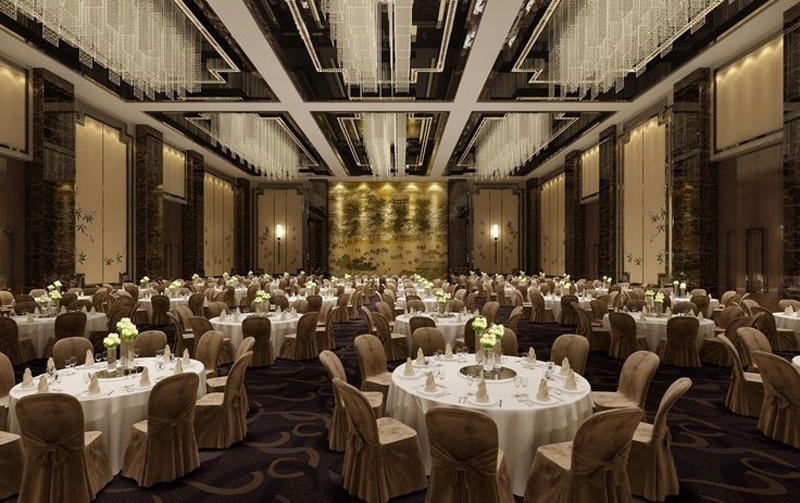 Known for celebrating king size events this lavish wedding venue spills nothing but royal elegance and flair. If you’re looking for party halls in Whitefield, there is no reason why you should look further than The Marriott Hotel. With 14 fabulous event and banquet halls to choose from there’s no you can go wrong with your decision. As a one-stop destination for all your pre-wedding and wedding celebration, their expert event planning staff ensure all your needs are met to the T.
Still looking for banquet halls in Whitefield? Check out some budget-friendly options here. If looking for wedding lawns, marriage halls or party halls in Bangalore, we’ve got some great options for that too. Check it out here.